Do you often lash out at people? Do you let your emotions rule your interactions with others? Do you find it difficult to see things from others' point of view? You are not alone. Despite the fact that we all have to deal with other people our daily lives, many of us have difficulties with interpersonal relationships. 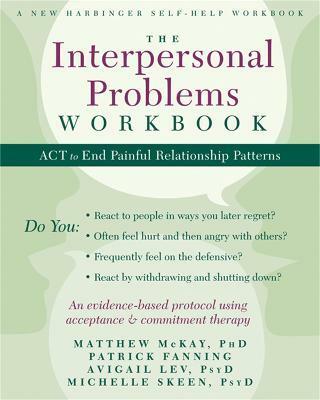 Written by psychologist and bestselling author Matthew McKay, The Interpersonal Problems Workbook combines research and evidence-based techniques for strengthening relationships in all areas in life-whether it's at home, at work, with a significant other, a parent, or a child. The skills in this workbook are based in both schema therapy and acceptance and commitment therapy (ACT), and are designed to help you connect and communicate effectively with those around them. ACT has been proven effective in helping people improve their relationships with others. The ACT skills detailed in this book include present moment awareness, diffusion, and flexibility-all of which will help you to improve your relationships with others. In this book you will learn what your schema is, and how to act on your values to communicate and get along with others. If you are ready to stop building walls and start connecting with those around you, this book presents powerful, effective tools for change. "The Interpersonal Problems Workbook is an excellent resource for any individual or therapist working with clients who have maladaptive relationship patterns. This workbook uses a treatment protocol that is grounded in the core principles of acceptance and commitment therapy. Not only do clients get to explore their schemas, but they get to learn about their core values and how to live a life of mindfulness. I highly recommend this book to anyone struggling with painful interpersonal problems. This workbook is an invaluable tool for any mental health practitioner or person wanting to improve his or her relationships." --Raychelle Cassada Lohmann, MS, LPC, professional counselor, author of The Anger Workbook for Teens, Staying Cool...When You're Steaming Mad, and coauthor of The Bullying Workbook for Teens "Our relationships with others that provide such enrichment and meaning to our lives, can, unfortunately, also a serve as a source of deep pain and suffering. This scientifically-supported and easy-to-follow workbook provides a step-by-step way to break out of long-standing patterns of behavior that prevent our relationships from being more vital and fulfilling. Think of it as an operating manual for turning around troubled interpersonal relationships. I recommend this latest contribution by McKay and his colleagues not only as a self-help guidebook, but also as a useful adjunct to their related book for mental health professionals working with those who struggle with interpersonal relationship issues." --Robert Zettle, author of ACT for Depression "The Interpersonal Problems Skills Workbook is a highly needed self-help book for those struggling with chronic interpersonal problems. The authors did an outstanding job guiding readers through the process of identifying their schemas, triggers as well as old behaviors; furthermore, they make sure to walk readers step-by-step on how to develop new behaviors that are in alignment with their interpersonal values. This self-help book will help everyone struggling with ongoing relationship problems. I highly recommend it not only because of its rich content but also because of the research that supports its evidence." --Patricia E. Zurita Ona, PsyD, psychologist at the East Bay Behavior Therapy Center and coauthor of Mind & Emotions "For most of us, when our relationships are not working, life is not working. Despite their central link to human health and happiness, psychology has been appallingly lax in developing specific methods that will help with interpersonal problems. This book helps end that odd silence. It puts forward a creative, step-by-step approach that research suggests can make a real difference in the quality of your relationships, now. Its clear, sound guidance will help you create a better life for you and those you love. Highly recommended." --Steven C. Hayes, cofounder of acceptance and commitment therapy and author of Get Out of Your Mind and Into Your Life "Inspired in part by the work of Jeffrey Young, founder of the schema therapy approach, The Interpersonal Problems Workbook offers valuable strategies for dealing with some of the most difficult challenges we face with some of the most important people in our lives. This comprehensive workbook provides the reader with meaningful ways to look beneath the trappings of early life themes that can prompt our self-defeating responses when triggered. We learn how to move beyond these embedded automatic patterns in order to achieve effective/adaptive interpersonal experiences and coping styles. Hats off to the authors for this creative and thoughtful guide." --Wendy Behary, author of Disarming the Narcissist "At the heart of happiness is the ability to have strong and healthy relationships. Struggling with interpersonal problems can make you miserable. This book teaches you proven techniques for developing the skills to relate to other people in a much healthier and productive manner. The Interpersonal Problems Workbook will help you deal with the thoughts and emotions that create obstacles in your relationships while also guiding you towards building genuine connections with the people in your life." --D. J. Moran, founder of the MidAmerican Psychological Institute "If you're tired of merely thinking and talking about your problems with family, loved ones, friends, colleagues, and coworkers, then this book is for you. It teaches you a host of new valuable skills that will actually not only help you with interpersonal problems but will also come in handy in many other areas of your life. The book explains in simple, straight-forward, and accessible language how certain thought patterns and beliefs about yourself and your relationship with the world can keep you unhappy and stuck in patterns of behavior that clearly have not worked in the past. It then quickly moves on and provides you with a variety of extremely helpful exercises that you can put into practice right away. These exercises are simple but they are not simplistic. They have proven themselves many times over and are backed up by a stack of research studies attesting to their usefulness. This book is for you and will help you if you are serious about moving past your relationship pain (and what your mind tells you about that pain) and are willing to take the steps toward doing what matters--you have nothing to lose and much to win!" --Georg Eifert, PhD, Chapman University Professor Emeritus of Psychology and coauthor of the Mindfulness and Acceptance Workbook for Anxiety "A well-conceived, research-based, step-by-step series of exercises guides individuals to identify and mindfully address the schemas that inhibit their ability to form happy, healthy relationships. It is not necessary to be especially well-versed in ACT to benefit from this practical approach. Everything you need to begin addressing the pain that accompanies poor interpersonal relating can be found in this highly worthwhile workbook." --Stan Tatkin, PsyD, MFT, clinician, researcher, teacher, and developer of a Psychobiological Approach to Couple Therapy(R) (PACT) "The Interpersonal Problems Workbook validates the emotional pain connected to interpersonal difficulties that we all experience throughout our lives. It provides worksheets and exercises to help readers gain insight into where this pain comes from, and teaches techniques to help people end these unhealthy patterns, subsequently having the effect of reducing emotional pain. This is a fabulous book that will help people get unstuck from ineffective relationship patterns, and that will provide clinicians with the much-needed, concrete tools to help clients with these issues."